Laxmi Devi Institute of Engineering & Technology (LIET), Alwar established by Marut Nandan Educational Society (MNES) in the year 2001 is affiliated to the Rajasthan Technical University, Kota and approved by Govt. of Rajasthan & AICTE, Ministry of HRD, New Delhi. It has a vision to create a center of excellence for the Technical Education, Research & Development and Consultancy. The Objective of the institute is to develop a nucleus campus to impart quality education in various disciplines of Engineering & Technology to meet the global challenges of fast growing market and business opportunities. Placements: The college has released seven batches of engineering graduate students, who are employed in glorious. multinational companies in India and abroad like, Microsoft, Google, Motorola, Ericsson, Accenture, ST Micro Electronics, Infosys Technologies, Tata Consultancy Services, Satyam Computers, Vedanta, Wipro Technologies, L&T Infotech, HCL Technologies, i-flex Solutions, Zensar Technologies, etc. The training and placement department is working with absolute efficiency and has a provision of moderate budget to spend on various activities. LIET is an institute accredited by TCS and a Nodal Centre of L&T Infotech and Infosys Technologies for Recruitment and Training. LIET follows a very simple and transparent placement policy. Companies are invited through e-mail messages, phone calls and faxes. The Placement Cell scrutinizes the job announcement forms of all companies and dates for campus visit are allotted to the companies accordingly. The dates are adjustable keeping in view the interest of both parties. The staff members help out the interested companies with the visit related assistance like, lodging & boarding arrangements; audio-visual facilities, auditorium / halls for pre-placement talks; written tests, group discussions and individual interviews. Students are get practiced by placement cell on written tests, group discussions and interviews as per the policy of the company. 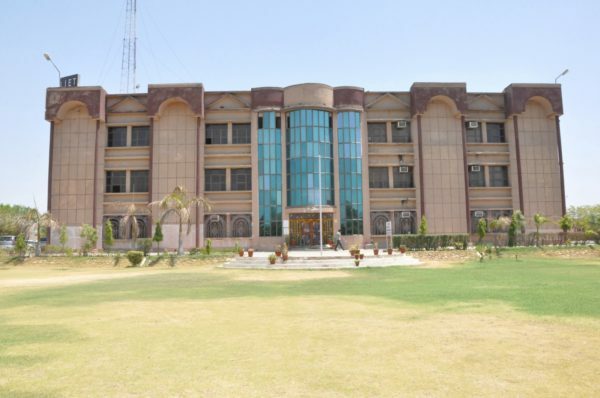 Campus: Laxmi Devi Institute of Engineering & Technology (LIET), Alwar established by Marut Nandan Educational Society (MNES) in the year 2001 is affiliated to the Rajasthan Technical University, Kota and approved by Govt. of Rajasthan & AICTE, Ministry of HRD, New Delhi. It has a vision to create a center of excellence for the Technical Education, Research & Development and Consultancy. The Objective of the institute is to develop a nucleus campus to impart quality education in various disciplines of Engineering & Technology to meet the global challenges of fast growing market and business opportunities. LIET means to produce Laborious, Intelligent, Educated and Talented Engineers. Central library: LIET has well stocked computerized library. It is fully air-cooled 5200 sq. ft. area forms the Institute’s library with a seating capacity of more than 200 students. Library is a member of DELNET, a network of 550 libraries of India housing about 30 lakhs books, thereby bringing their resources within the realm of our library. This allows the student and faculty members to access almost all libraries of India. A fully automated library facilitated with- acquisition, cataloging and serial control, circulation. It is open for 12 hours a day, caters to the need of researchers, post graduate and undergraduate students. It can be kept open for longer hours, if required. The library is equipped with all modern means of teaching aids such as television set, LCD projectors, OHPs, etc. Library provides photo copying services to the students. All textbooks are provided to the students from the book bank and the general library (FREE OF COST). Specialized information about seminar reports, conference proceedings, technical magazines and research papers available on internet is also provided on demand. Hostel: LIET aims at training professionals of higher standard and moral caliber. The rules and regulations are framed so as to train them for reaching the goals for which the institution was started. It aims at ensuring harmonious and friendly living among the students of various states, and inculcating self discipline” in each individual, and making the hostels serve as a training ground for a purified, fruitful and successful life and for the development of body, mind and soul as a whole in every student. The Six Hostels & One Luxury Hostel (A/C) are under the overall administrative control of the Chief Warden of the hostels. Each Boys’ Hostel is being managed by one Warden and some Senior Lecturers. The girls hostel is being managed by lady Warden, few Senior lady teaching staff members of the college. Each student is provided with a bed, one table and a chair in their respective rooms. Each room is provided with a ceiling fan & almirah.